Amber is one of several technically defined colors used in automotive signal lamps. In North America, SAE standard J578 governs the colorimetry of vehicle lights, while outside North America the internationalized European ECE regulations hold force. Both standards designate a range of orange-yellow hues in the CIE color space as "amber". In the past, the ECE amber definition was more restrictive than the SAE definition, but the current ECE definition is identical to the more permissive SAE standard. The SAE formally uses the term "yellow amber", though the color is most often referred to as "yellow". This is not the same as selective yellow, a color used in some fog lamps and headlamps. The entirety[clarification needed] of these definitions lie outside the gamut of the sRGB color space — such a pure color cannot be represented using RGB primaries. The color box shown above is a desaturated approximation, created by taking the centroid of the standard definition and moving it towards the D65 white point, until it meets the sRGB gamut triangle. 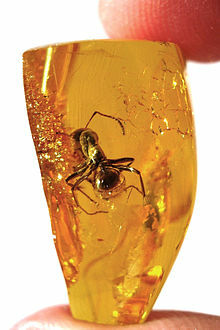 These pendants made of amber are also amber colored. The Digital Equipment Corporation (DEC) VT220 computer terminals were available with amber phosphors in their CRTs. In Gaelic games, Armagh play in a darker Amber color (the amber that is prevalent in the Irish flag), Offaly play in the original colors of the Irish flag (Green, white and Amber) and Kilkenny also play in black and amber, albeit a more yellow amber. Amber is a color worn by English Football Clubs Hull City AFC, Bradford City AFC, Barnet FC, Shrewsbury Town FC (As part of stripes), Mansfield Town, Cambridge United FC and Sutton United. The color is also worn by the Scottish football club Motherwell FC, as well as many other sports clubs around the world. 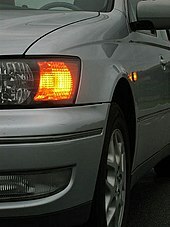 A turn signal emitting amber light. Amber is used in business management to indicate a status of work, as in RAG status. R stands for Red, A stands for Amber, usually represented as the color Yellow in the reports, and G stands for Green. Typically Green indicates that all is well and no action is needed, Yellow indicates a wait-and-watch approach or some action to make the status Green, and Red indicates that the work or project is not as planned and requires immediate attention and corrective actions to turn it to Green status. The appearance of the word "amber" here is only a coincidence; it comes from the name of a child abduction victim, Amber Hagerman. Wikimedia Commons has media related to Amber (color).